My son Byron is an international teacher and back in 2002 he took up a post in Bogota, whilst there he met Lina and the rest is history. They married in 2005 and obviously we attended the magnificent Colombian wedding. We returned to the country in 2006 and during our time there we took a trip down to the Amazon region. Having Lina with us was a definite advantage, she spoke the language and was able to organise it all. We flew from Bogota to Letitia where Colombia meets Brazil and across the river is Peru. We stayed at the hotel there for a couple of nights (it was very much a border town in the middle of the jungle, the main occupation being drug smuggling) before taking a boat (called "The Chicken"!) down to a place called Parque Nacional Natural Amacayacu. We stayed in wooden chalets on stilts on the banks of the Amazon. There wasn't any glass in the windows and soft furnishings were unheard of! We ate local produce of mainly fish and fruit. 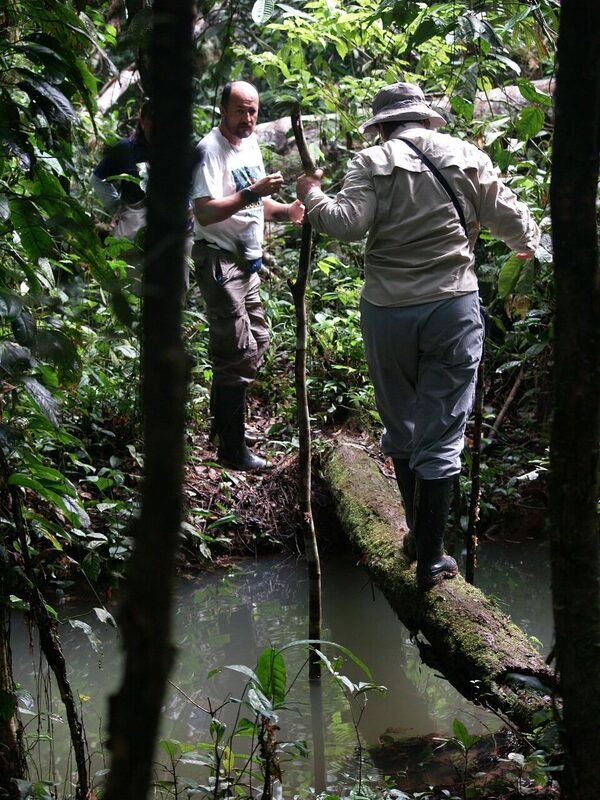 We had a wonderful guide called Guillem who took us to local villages and deep into the jungle looking at the wildlife. We even took the boat across to Peru, there wasn't any border control! The local people were all very friendly and amazed to see Europeans. Non Colombians didn't visit for fear of the Farc guerrillas although we didn't encounter any of them. The army did stop by one night, they arrived in the middle of the night, set up camp below our chalet, joined us for breakfast then melted away back into the jungle.....scary. One of my favourite days was climbing up into the tree canopy and watching the pink dolphins way below us. We were amongst the birds nests and the sound was incredible. It was the rainy season which meant that it was incredible hot and the heat built up until the early afternoon when the rain poured down as a monsoon. It was short lived and thankfully as I was wearing Rohan clothes I got soaked but equally quickly dried off. It was a holiday of a lifetime and I shall never forget it. The best pieces of clothing I took and couldn't be without were long sleeve blouses, a wide brimmed hat and most favourite were my Expedition Cargo trousers, two pairs, green and grey. It is testament to the quality of them that I still wear them for trekking in Scotland now! Because of my daughter in laws inside knowledge of her country (her Auntie was a doctor in the jungle) we knew all the correct clothes to take, including wellies to walk in as boots would have soon got soaked, I just wish I had had better wellie socks! There was nothing bad at all, the whole holiday was fantastic especially as we were somewhere no one else I knew had been and weren't likely to ever go.